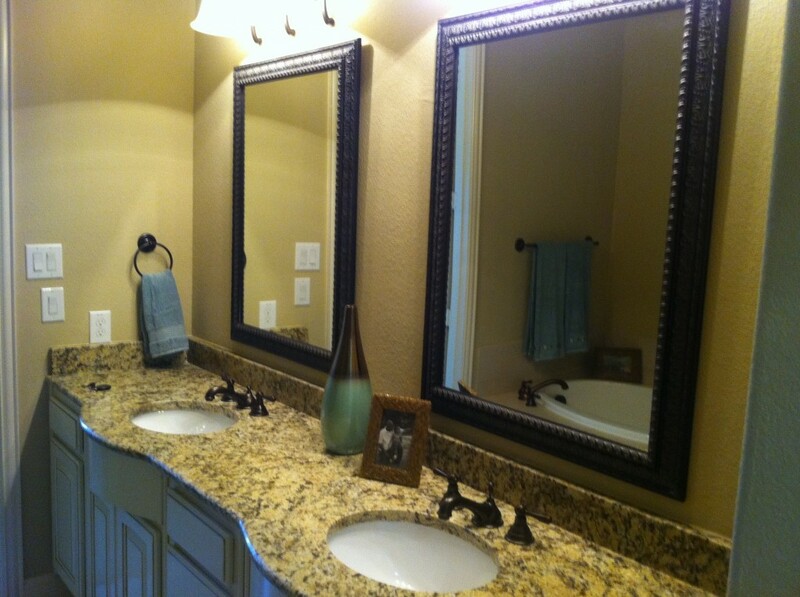 The vanity and mirror are often the focal point of most bathrooms. Because there is normally very little furniture in a bathroom beyond the vanity, it carries a lot of the weight in terms of decor. The mirror you hang above the vanity is as important as the cabinetry. If you are going for a regal theme, consider a baroque inspired, gilt frame, the type of frame you might use to showcase a prized oil painting. The overhead lighting fixtures should be modeled after the same time period. Some people go so far as to hang a chandelier. Add an equally antiquish faucet, a gold-veined marble top to a vanity with curved, scroll legs and a gold-tinted frameless shower enclosure and you’ve got a royal setup. Another bow to elegance is a Venetian mirror. These mirrors are unique because their frames are usually made from artfully cut, etched and assembled mirror pieces. The frame is usually ornate and is often floral in design. If you like the look of a mirror which is all glass including the frame, but you don’t want an intricate design, you can find simpler more geometrical designs available. These mirrors look particularly nice in all white bathrooms with white cabinetry. A crystal clear frameless shower enclosure would complement the expanse of white. If you favor a more rustic look, then consider an unpolished wood cabinet plus a vessel sink. A vessel sink is often bowl shaped and sits atop the cabinet instead of being inset. Vessel sinks are made from a variety of materials, such as tempered, colored glass, hammered copper, and porcelain. There are porcelain sinks available with patterns to make them look like the ewer bowls people set on washstands in centuries past. A mirror framed in distressed or rough-hewn wood would probably add additional rustic charm to this decor. For a thoroughly modern look consider pairing a long sleek vanity with a long sleek, frameless mirror. No ornate frames or fussy details for this type of decor. And the lighting above the mirror should be recessed and efficient. There is nothing more modern than a walk-in shower behind a frameless wall of glass. For a truly eclectic look you could mix and match the styles of mirrors. Bathrooms with eclectic decors often combine modern with antique elements. In this type of bathroom you can expect to see the unexpected such as a stained glass window, a brightly painted vanity, or even an entire wall covered in mosaic tiles. Other unique elements you might find; pendant lighting, a clawfoot tub, wallpaper with a pattern more suited to an old-fashioned parlor, or a small picture gallery. Though it seems like anything goes with this type of decor it really takes a practiced eye to know which pieces complement each other. Whether you have two sinks at either end of a long vanity or two sink stands separated by a dressing table you might consider a series of mirrors rather than a single mirror. Above each sink you could place a vertical mirror and for the dressing table perhaps a wider mirror with a matching frame. Visit our showroom in Dallas, we have a broad selection of mirrors and frameless shower doors to suit any decor. That mirror is lovely. It’s very elegant and with its minimalistic design and rustic look. However, I’d love to have a brighter light that what is used there on the picture. A room can be completely reborn by just adding wall mirrors Thanks for the information. The vanity and mirror are often the vital point of most bathrooms.